"All human beings--male and female--are created in the image of God." This simple truth tells us so much about God and about ourselves. 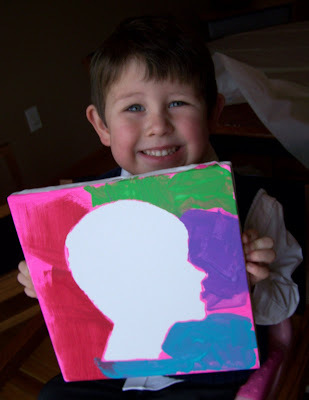 The kids loved making these "resist silhouette paintings". I am so happy with how they turned out...a keepsake for sure. and contemplate how we are each created in God's image. As a parent, I look at these silhouettes of my sweet children adoringly. with the same admiring eyes? "Why does Jesus love me?" It is a touching question to ponder. Why? I'm not sure of all the reasons, but I know that He does. as tenderly as any parent ever loved their child. Take a profile picture of your child standing against a white background. Print the picture in the size that you'd like to work with. Transfer the outline onto removable clear contact paper. You can do this by holding the image up to a window and tracing using permanent marker. Using an "exacto" knife, cut out the silhouette. If you are careful, you can use both images, like we did. and place it on your canvas. We used acrylic paint on a 10x10 canvas. Note: If you are doing this with very young children (like I was), you might want to get them started by outlining the image (with paint) for them before you let them have at it. This will help to seal your contact paper to the canvas around the all-important edges of your silhouette. This helped us, since our contact paper didn't stick to the canvas as well as we would have liked. The end result is very worth the time and patience that it takes to create! You can see other tutorials for these silhouettes here and here. these are really beautiful Jocelyn! you are really a great inspiration for coming up with meaningful activities for your children. Ahhh! I want to do this!!! Can't wait to do this with my boys! !